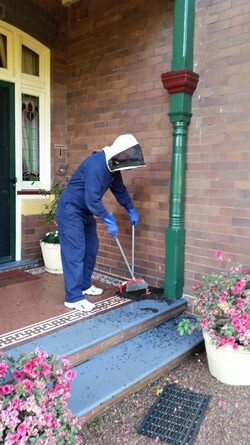 If you are having some problems with bee removal in Sydney, you may want to visit the Amatuer Bee Keepers Association of NSW website for information on how to remove bees safely. If they are gaining entrance to your home, or you are worried that bees may become a threat to yourself or family, consider hiring us as we are prompt and effective at bee fumigation. Click Here To Call 0417 251 911 or email bruce@a1pestcontrol.com.au to book your inspection and treatment today! This offer won’t last! Bees and Wasps are closely related to ants with regards to their biology and are members of the scientific order associated with insects known as Hymenoptera. Characteristics of this are factors such as their social colony structures and communication habits. There are many studies that provide evidence of the benefit that bees provide in a natural habitat. They assist in the pollination process as well as providing delicious honey. But, when they infest your home and property they seem more of a nuisance than of benefit to anyone, this can develop into a serious issue if you have children and pets or anyone allergic to bees around. When disturbed bees can become quite aggressive and swarm a target resulting in hundreds of extremely painful stings to their victim. In the event of a bee infestation occurring at your home it is advised not to cross their flight path or disturb their nest. 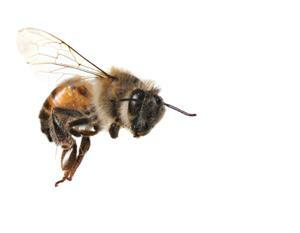 Identifying an infestation is one of the first steps toward solving any bee related issue. It would be a good idea to have a walk around your property and home every month to check for signs of bee hives or crowded bee activity. 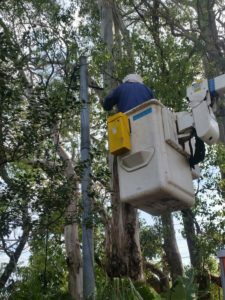 Beehives are often found on overhanging eaves or other extruding structures around your home or exterior buildings/sheds as well as checking for any holes within wooden surfaces, window frames and fencing posts. Hives can also be found in trees or large bushes. They prefer these areas as they provide shelter from the environment and weather events. Another dead giveaway would be having a cloud of bees swarm around your home or property. It is important to take care when this happens and not to do anything drastic. “Swarming is a natural part of the reproductive life cycle for honey bees and they are not necessarily aggressive during this state. For the removal of a swarm the NSW Department of Primary Industries advises AGAINST removing the swarm yourself. In rare cases bees might even infiltrate a home and infest the wall cavity of your home. In this case there is not much a layperson can do, the best option would be to contact a professional pest control firm to inspect the extent of the infestation and advise the appropriate treatment method. Seeing a small bee presence doesn’t guarantee an infestation as bees often travel large distances in search of food etc. Removing the bees can be the easiest or the hardest part of dealing with an infestation, it all depends on how you approach the infestation. After establishing which type of bee is infesting your property you can then decide how to precede. It is quite easy to get rid of Yellow Jackets or Bumble Bees however, dealing with the regular honey bee is a bit more complex due to their nesting and colony habits. Some DIY approaches are listed below but we would NEVER advise for someone to approach a bee infestation by themselves. Appropriate safety equipment and treatment equipment is always recommended and as such we would advise seeking out a professional pest control company to ensure your safety as well as well as the complete extermination of the colony. Bee Trap: you can create a home made bee trap out of a 2L soft drink bottle. This is done by cutting off the top neck of the bottle and inverting it into the bottom half of the bottle which creates a funnel shape. The edges are then taped shut and any sweet/sugary liquid can be poured in to tempt the bees. Combine this with washing detergent to trap the bees and set it out near the bees favourite spot. Cardboard box Box Bee Swarm Removal: This is a common method but not recommended personally. Bee swarms are sometimes found on the end of tree branches. Take a large cardboard box out to where the swarm is in the early morning where the bees are most sluggish, Shake the branch so that the bees drop in the box and close the lid making sure the queen is not still on the branch and re locate. CAUTION! This method is also NOT recommended for the layperson and is probably the most dangerous. Disclaimer: Though the above treatment options are often seen as viable we would never encourage anyone to follow these options as they are known for not working effectively and often resulting in an aggravated bee infestation. In accord with the statement by the NSW Department of Primary Industries we would recommend a professional pest controller as the only valid treatment option. A1 Pest Control has over 35 years of experience in the pest control industry and we’ve treated a large portion of the Sydney Region with stellar feedback and customer relations. We would like to make note of the fact that as a pest control company our services do come at a cost, though we are happy to give you a quote over the phone we are unable to engage in bee removal for free, if this is not an option for you, you can contact your local counsel or bee keepers association for more information or other options. Australia you can find over 1500 different species of bees! Thus they are essential to our current lifestyle, but not when they’re hanging out in your back yard. This article will cover the bee facts that you need to know to avoid an infestation. Bees have sturdy little bodies and range from sizes as small as 2mm long all the way up to 39mm (3.9cm) long. They come in the colours black or brown with maroon, yellow or bluish stripes. They have flattened rear legs which are used to collect and then transport pollen. Australia, most commonly the smaller species, which actually have no stinger! They are fairly harmless and spend their time pollinating flowers. Many species of bees are solitary; however species like the honey bee and bumble bee are very social. Bees are also known for the delicious honey they can make, which during the lifetime of one bee can become a substantial amount. Bees are an important part of nature but only when they are controlled within suburban and residential areas, otherwise they can become medical as well as structural liabilities. Though bees are not inherently aggressive they usually sting when they feel threatened and some can sting multiple times. Often these stings aren’t immensely painful, but to a child or someone with an allergy a sting can have severe consequences! Firstly determine whether you actually have a bee problem or whether it is another species of insect that has infested your garden. In the case of a bee infestation make sure what degree the infestation is at, some bee colonies can contain anywhere from 8,000 to 60,000 bees! If your infestation is severe contact a pest control expert immediately. Another option is purchasing a bee trap, though less humane it is an option for smaller bee problems. It is often an option to have a beekeeper remove the hive and relocate it, as there is a growing threat known as CCD (colony collapse disorder; where the worker bees of a colony abruptly disappear which leads to the colonies demise and impacts negatively on agricultural pollination). If you are unsure of how to approach a bee problem on your property, or you just want to know more of the bee facts, don’t hesitate to call up your Pest Control experts at A1 Pest Control who would be happy to safely quote your problem using environmentally friendly methods. 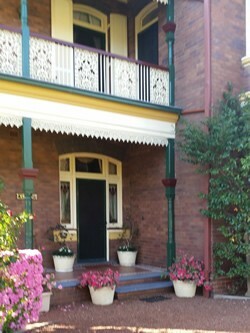 Contact Bruce Gow on 0417 251 911 today for an appointment! Bees’ role in pollinating is an extremely important and beneficial role; however, the risks that come with bees around your home can also be quite extreme. The aggressiveness of bees and their stings can become life threatening for certain individuals, so if you live near or have seen a bee, extermination is usually the answer when protecting your loved ones. There are preventative measures you can take to make your home and garden unattractive to this species. Bees usually seek out warm spots to wait out the winter months before breeding season begins. Filling in cracks around your house can prevent them from staying around your home and attacking you in the warmer months. Check around doors, windows and vents for places that bees may find. Bee extermination may seem extreme, but if there are bees or nests in and around your home, there may not be any other choice. Placing fake nests near your home will discourage bees from building another, as most bees don’t like their nests to be close to others. Your local gardening store is most likely a carrier of these decoy nests. Always remember to remove and cover rubbish and clean up food, especially outdoors. Bees like sweet smells and sugar, so don’t leave soft drinks or sweet foods outside. Keep your outside entertaining area clean and swept. Given the massive degree of natural control of plant pests afforded by parasitic and predatory wasps, and the extensive pollination provided by bees and others, we often underestimate the benefits of this abundant and highly successful group of insects. Adults are very small to large and of diverse forms. Wings may be present, reduced or absent. When present, wings are membranous; the forewings are usually much larger than the hindwings, and there is a coupling mechanism. Mouthparts are mandibulate, with some modifications for lapping or sucking particularly in bees. The cuticle is often highly sclerotised. Compound eyes are usually large, three ocelli are often present, and antennae are variable. Females often have an ovipositor developed for sawing, piercing or stinging with a venom. Larvae are also highly variable in form, some are caterpillar-like, other more grub-like. Some have thoracic or abdominal legs or both; others are entirely legless. Their chewing mouthparts and head capsule are often distinctive. Habits vary enormously within the group. Some are solitary insects, while others such as bees are social, forming sometimes very complex societies that involve different castes and a high degree of communication. Although many adult hymenopterans feed on nectar or pollen, larvae may be foliage eaters, wood borers, internal or external parasites of insects and allied forms, or feeders of prey or prepared diets provided by adults. Reproduction may be sexual or by parthenogenesis. Eggs of parasitic species are usually laid in or on the host animal stung with a preservative venom. Eggs of foliage eaters are usually laid in or on the host plant. In social insects, eggs, larvae and pupae are tended by workers. Larvae undergo a number of moults before pupating. Some sawfly species are pests as foliage eaters, some wood wasps are pests of forest trees, mud daubers upset the houseproud, masonry bees burrow into the soft mortar between the bricks of older houses, some wasp species are troublesome to humans and some ants may be regarded as household pests; but by and large, the group is very beneficial. A method sometimes adopted where insecticides are not acceptable involves fastening a cone of cardboard over the entrance into the wall, with the broad end against the wall over the problem area, and the small end (about 6-10mm across) outwards. The bees can leave and resettle elsewhere, but they cannot re-enter the small aperture of the cone, so gradually the hive dies out. If the hive not been established for any length of time, the entire hive might leave. Where the hive must be killed, particularly when allergic people are likely to be stung, dichlorvos is an insecticide often used for the control of bees (pesticide regulatory authorities may require a permit if this use is not indicated on the product label). Holes may be drilled into the wall and the insecticide forced in using a cylinder of carbon dioxide and dichlorvos. Foaming agents in any other insecticide approved for bee control would also provide spread of the insecticide inside the cavity. If the bees are all killed at the time of treatment, residual life of the chemical is not required because the entry holes would be closed as part of the treatment follow up. This treatment is very effective, particularly if done at night when most bees are in the hive. When control is necessary in the daytime, the pest controller must be experienced in handling bees and have protective clothing. If the hive has become well established, there may be honey, which will attract ants and provide the client with another problem. It is important that the bee is identified correctly, as the native honey bees may be involved in a situation where killing of the hive is requested and is not necessary as the native honey bee does not sting. The native bee also nests in trees and in hollow log sections of large stumps. It is a much smaller bee and of a different colour. Wasp’s particularly the papernest wasps, are dayflying insects. They can be caught and destroyed more easily and safely at night, when they have congregated on the paper or mud nest. The paper nest and wasps may be removed by enclosing the wasps and nest in sound plastic sheeting or a bag at night, severing the nests contact with the surface, and sealing the bag for disposal or release elsewhere. There are some people who are allergic to, and may die from, wasp stings. 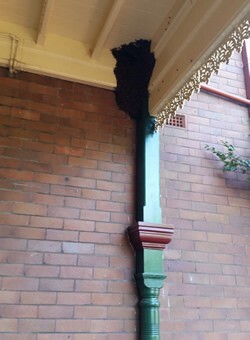 The European wasp is now established in NSW, Victoria and Tasmania and will in time occur throughout much of Australia. The English wasp has been known in Victoria for some time and has similar habits to the European wasp. Separation of these two species is normally beyond the ability of pest controllers. Appearance The workers of both species are sterile females about 12-15 mm long, with yellow bands on a black body. They are fast flyers, with clear wings that fold longitudinally over their bodies. Queens and males measure about 20mm long, the queen having a stout abdomen and the male, a long thin abdomen. The nest varies in size from about 15cm to about 5m and may contain up to 4 million cells and over 100 000 workers. The wasps nest mostly in the ground, tree stumps, rockeries, wall cavities and roof voids. Each nest usually last one year, but in warmer climates the nest may survive and extend. In winter the males die off, and the newly fertilised queens hibernate to build other nests the following year. The new queen lays eggs in the cells of the nest, and after some weeks in the larval stage the wasps pupate and emerge as adults, which take over the work of the nest. After one summer, the nest may have 10 000 individuals. 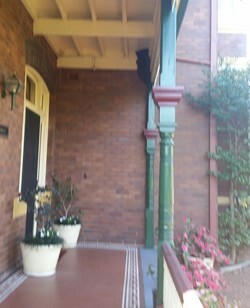 Click Here To Call 0417 251 911 or email bruce@a1pestcontrol.com.au.